Online sales have ended, but tickets are still available at the door. Come early to reserve your seats. For those who purchased tickets online, please bring your receipts. Thank you! 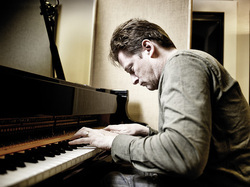 Bill Carrothers has been a professional pianist for over 25 years. He has played many venues throughout the U. S. and Europe including the Village Gate, Knitting Factory, Birdland, Blues Alley, New Morning (Paris), the Audi Jazz Festival in Brussels, the Nevers Jazz Festival (where he shared the bill with Abbey Lincoln), the Montreal Jazz Festival , Jazz Middelheim, and the Marciac Festival in France. In October of 2000, Mr. Carrothers headlined the prestigious Rising Star Tour throughout Germany, Austria, and Switzerland. He has been a leader on seventeen recordings, all of which have received critical acclaim. His sideman credits have included some of the greatest names in jazz, including Joe Beck, Scot t Colley, Buddy DeFranco, Dave Douglas, Curtis Fuller, Eric Gravatt, Drew Gress, Tim Hagans, Billy Higgins, Ari Hoenig, Lee Konitz, James Moody, Gary Peacock, Dewey Redman, Charlie Rouse, James Spaulding, Bill Stewart, Ben Street, Ira Sullivan, Toots Thielemans, and Benny Wallace. Visit jazzatstudioz.org for more information.